Nicola Salmoria recently contacted me about his new puzzle app: Brain Twirler. Nicola Salmoria came out with Twin Beams last year. Twin Beams made the prestigious list of Best Puzzles of 2012. Which I still play now and then. Brain Twirler was inspired by Spin Mix by Ivan Vassilev. I reviewed that about a year ago. The object is to swivel the rods around the white dots so that the red bar can get to the top. Puzzle 1 takes 1 move, puzzle 2 takes 2 moves... puzzle 50 takes 50 moves. Puzzles are unlocked in progression, but there are always 4 puzzles unlocked, so if one gets stuck on a puzzle, they can try the next one. Right now I've solved levels 1-25, but I've skipped 2 levels. Level 25 I did in 87 moves - way over the minimum. This is a very challenging set of puzzles! Brain Twirler comes out today on the App Store. Nicola sent me a demo version. One of the perks of being a world famous puzzle app blogger! Oh yeah. 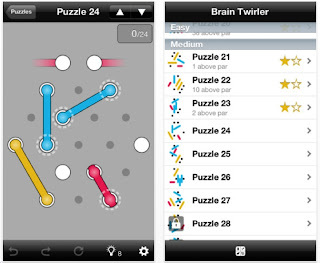 Brain Twirler easily makes the List of Best Puzzle Apps of 2013! Sorry about that. I was initially targetint iOS 5+, but then I wanted to use some iOS6-only features (most notably the social sharing menu), and since over 80% of iOS users are already running 6.0 or later, it made sense to make it a requirement.